Here comes more couch co-op! Nick and I got our hands on the New Super Mario Bros Wii title, and we had some good, classic, clean fun! There were no naked ladies, no suggestive sword poses, no barfing zombies, no brown-nippled serial slasher emperors...and we still managed to enjoy ourselves! New Super Mario Brothers has a short way to go to become a serious contender as a solid co-op hit, but it's coming along nicely. Don't get me wrong: if it were released tomorrow, it would still hold its own, but I have the feeling that Nintendo has more up its sleeve than we've seen so far, which admittedly isn't much. Hammer Brothers gonna knock you out, fool! The game itself hearkens back to side-scrollers of old, taking the vertical levels one step further by allowing players to trampoline from each other's heads and by adding wall jumps to the modest number of actions available to the player, who actually holds the Wii-mote sideways like a classic controller. The official "Classic Controller" has not been named yet as a valid option of character control, but considering that some actions (namely: picking up your co-op friends, and performing a spin-jump) require you to shake the remote...we doubt that it will be. In addition to the two moves mentioned above, shaking the Wii-mote is the best way to ensure a quick respawn should you expire: your character will automatically appear on screen trapped in a floating bubble, and a couple of quick Wii-mote shakes will gravitate the bubble towards your co-op partners, so that one of them can pop it and release you back into play. 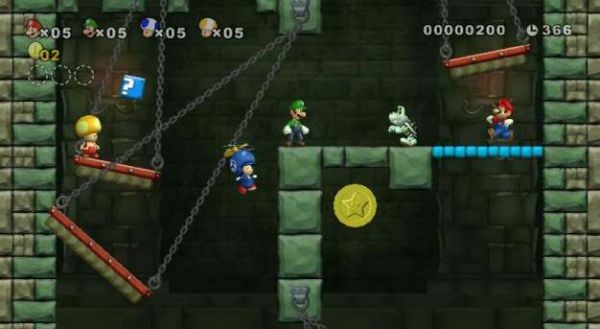 Like many of the arcade classics, players will share coin collections within the game levels, and collecting enough coins will present all players with a 1-up. However, the similarity ends when the level ends, grading each player on the number of coins collected, number of enemies vanquished, etc. This little bit of competition has gone a long way to keep the fun fresh, especially in casual titles, which is what New Super Mario Bros appears to be by all counts. These dungeons are full of new gimmicks and hidden areas. We have been told that suits will once again return to the series in the new forms of penguin, propeller, and various others. To use the propeller suit you simply shake the Wii-mote and begint o fly. The faster you shake the faster you rise. Sadly, much to Nick's dismay, we didn't see the penguin suit. Yoshi will be back, emerging from eggs as we fondly remember his roots to be. We did get to see someone snag a Fire Flower, which behaves just as it always has...with the benefit of upgraded visuals. 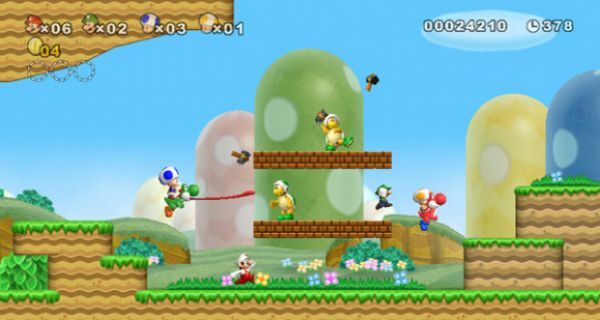 Currently, New Super Mario Bros does not support drop-in/drop-out functionality, a bummer for sure. However, Nintendo is looking for a way to implement this before release, which is currently not scheduled. 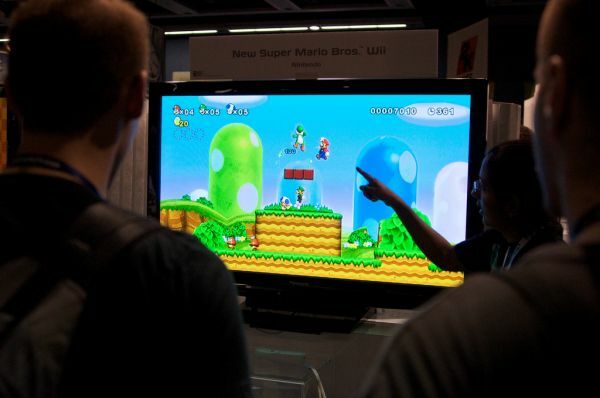 According to Nintendo EAD, look for New Super Mario Bros sometime this winter.